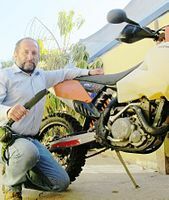 "Thanks Nancy for your fast management in the sale of these special knives, I am very happy with my new knife Shrapnel - excellent all-purpose in the back country, a great companion for my new Selvans, a great tool, the best. Note from XK: C.B. carries both a Shrapnel OG desert finish and the survival knife, the Selvans.